Great rugged casual watch. Really love the robust features and cannot wait to take advantage of the tide chart when kayaking. The Casio men's G Shock digital watch is just as active as you are. It has a 1/100-second stopwatch and a countdown timer. The electro-luminescent backlight with afterglow shows everything in the dark. It's shock resistant and water resistant up to 200 meters. 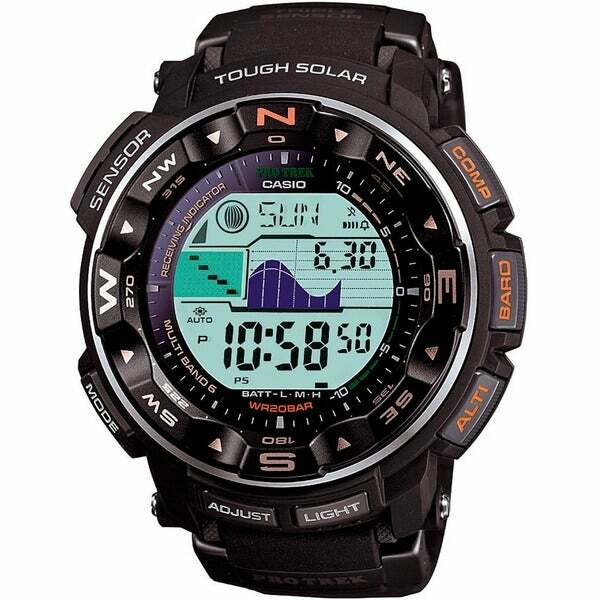 Made of resin and mineral crystal, this mens sports watch is lithium battery powered. Recently bought this watch for my husband. This is by far the best deal on an ABC watch. There are so many great features packed into this watch it's unbelievable. My husband loves to fish so having the Barometer and tidal calendar right on his wrist is perfect. Additionally, it has phases of the moon. It has Atomic timekeeping which makes it great for travel. Overall, I would rate this watch as perfect. It is well worth the price with the amount of features encased in an extremely durable shell. I would highly recommend for outdoorsmen. I am not a "techy" person so I was concerned about being able to learn the many watch functions. To my surprise, I was able to calibrate the compass, set the proper time zone, understand the barometer and altimeter readings, and charge the watch with no problems. I was concerned about the size but it actually fit my (female) wrist well and did not feel too heavy yet seems very rugged to handle the high demands of backpacking. Best of all, I do not have to put on my reading glasses to use it as the display is large and very easy to read. Very nice watch with so many great features. Perfect for those in the military. "Does this model have a tide display?" This model does not have tidal display.